This Destiny-class SuperLiner truly is a triumph of the shipbuilder’s art. With her spacious staterooms, private balconies, two level dining rooms and spa, and acres of sunny decks, she can take you from Miami to the Caribbean in style. She even gives you a choice of two Caribbeans! Sail west from to Cozumel, Grand Cayman and Ocho Rios, Jamaica. Or sail east to San Juan, St. Thomas and St. Croix. There are tropical wonders sure to thrill you whichever itinerary you choose. Come aboard this Fantasy-class SuperLiner for superb food, spectacular entertainment, fun activities and non-stop nightlife. Your adventure starts in Tampa on Sunday, and takes you to exotic Grand Cayman with its fantastic Seven Mile Beach, and Playa del Carmen/Cozumel famed for its modern pleasures and ancient Mayan ruins. You’ll even cruise the Mississippi River and visit New Orleans. What a week! Beaches, duty-free shops, historic landmarks, and a chance to finally hear Dixieland jazz in the French Quarter. The beauty of The Bahamas is almost beyond description. Which is why you must see it for yourself aboard the “Fun Ship” FANTASY. Departing from Port Canaveral, this popular floating resort will glide through aqua waters to visit islands famed for their pristine beaches, renowned dive sites, emerald golf courses, and international duty-free shops. Both cruises give you time to discover Nassau by day and by night. 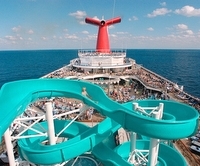 The 4 day cruise also visits Freeport, which offers its own special charms and attractions. She was our very first Destiny-class ship and is one of the largest, most popular ships in the “Fun Ship” fleet. Let this fantastic floating resort take you from San Juan to your choice of two 7 day Southern Caribbean itineraries. Both include St. Thomas/St. John and Aruba, but the “Dutch Treat” route will also take you to St. Lucia and Curacao, while our “European Delight” includes Antigua and Guadeloupe. Just think, four island destinations, plus all the excitement of cosmopolitan San Juan in one 7 day vacation!